IBM Tivoli Workload Scheduler and IBM Tivoli Dynamic Workload Broker are key products in the comprehensive, on demand Tivoli workload automation portfolio. Tivoli Workload Scheduler is the IBM centralized job scheduler for distributed, mainframe, and end-to-end environments that allows you to do batch scheduling based on a calendar. Tivoli Dynamic Workload Broker extends Tivoli workload automation capabilities by providing dynamic optimization of workload processing based on the performance of the scheduling infrastructure and workload demands. 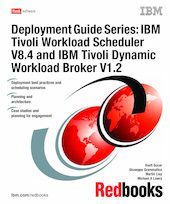 In this easy-to-follow IBM Redbooks publication, we cover different scheduling scenarios with Tivoli Workload Scheduler V8.4 and Tivoli Dynamic Workload Broker V1.2 in distributed environments. We also discuss best practices for designing and implementing a scheduling solution for small, medium, and enterprise accounts. Finally, we cover the sales engagement planning for a Tivoli workload automation portfolio, including a sample statement of work. The primary audience for this section is Business Partners and pre-sales Systems Engineers working in this area. This book is a major reference for IT Specialists and IT Architects working in the Tivoli workload automation area.